We were proud to have participated in the Global Eclipse Gathering in Oregon this year, a collaboration of 13 festivals organized by the Symbiosis team. 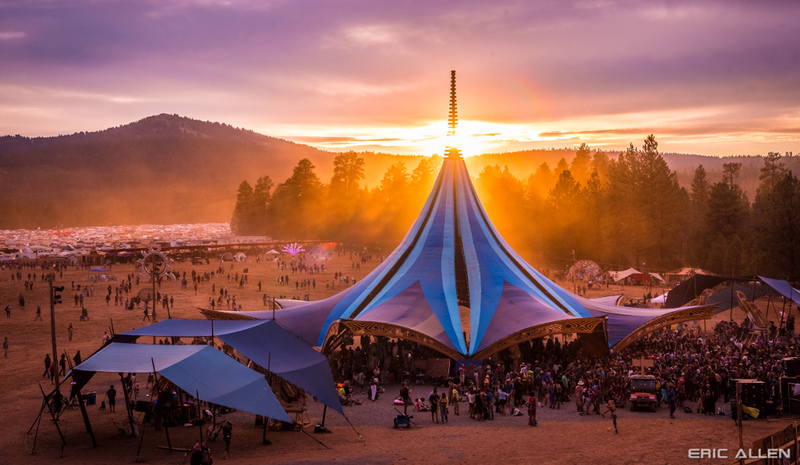 The gathering’s immense scale and creative scope impressed us while the celestial event, along with the beautiful group of people that came to witness it filled us with inspiration and awe. We were also excited to contribute 3 large scale and 5 medium scale structures to the event that provided both beautiful backdrops as well as functional spaces for music, yoga, performances and workshops of various stripes. We work hard to create event architecture that both astounds in appearance as well as impresses in functionality. 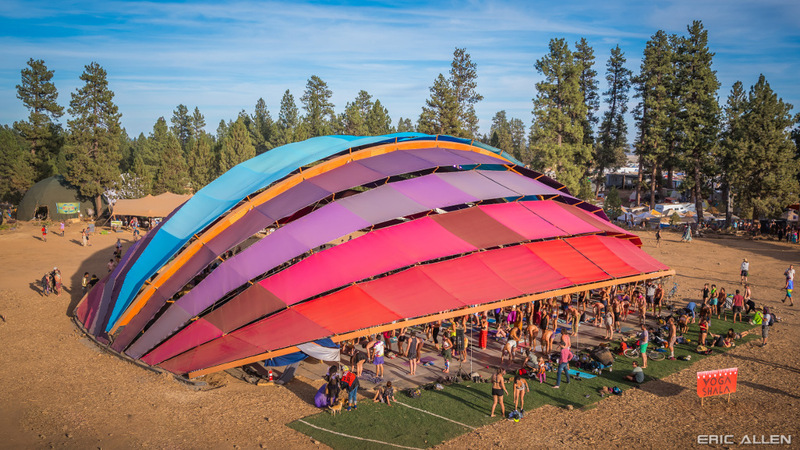 Oregon Eclipse provided ample opportunity for Do LaB to deliver both. Lillikoi made its debut at Lightning in a Bottle 2017, but we are just getting started with myriad ways to put this one to work. 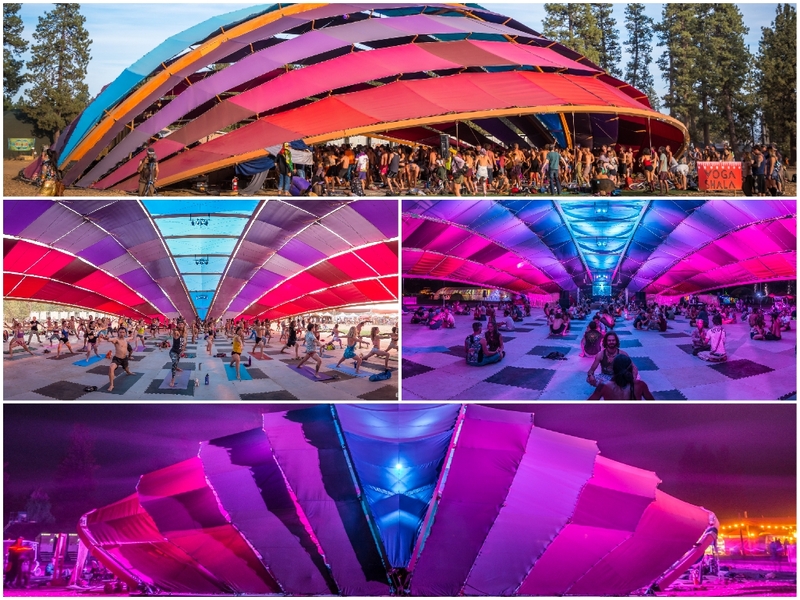 At Oregon Eclipse it served as a shaded dance area as well as FOH for the Earth Stage, which stood a few feet away. 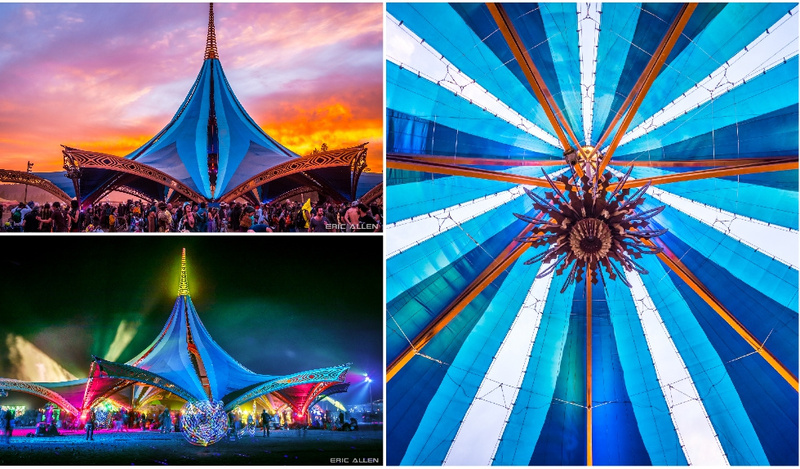 The pitched openings of the lillikoi flower inspired structure offered clear views of the musicians stage, while also creating a self-contained dancefloor that created incredible views of its own. 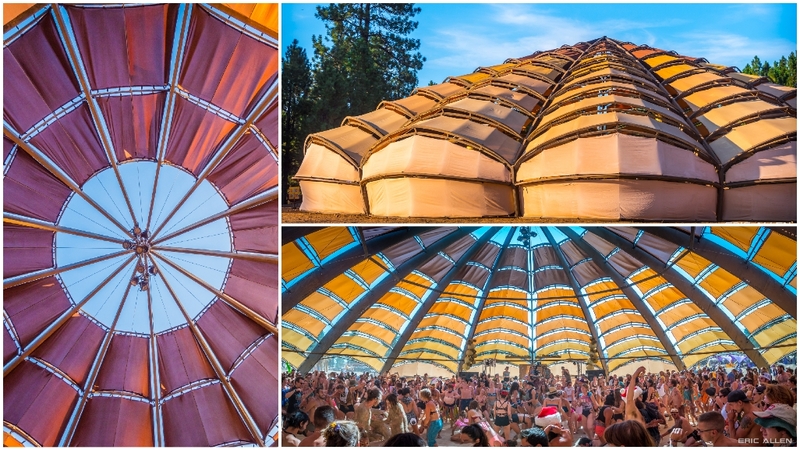 To expand the amount of shaded space and allow the Oregon Eclipse crowd plenty of space to dance, we added two of our Quinoa shade structures along the main entrance ways. 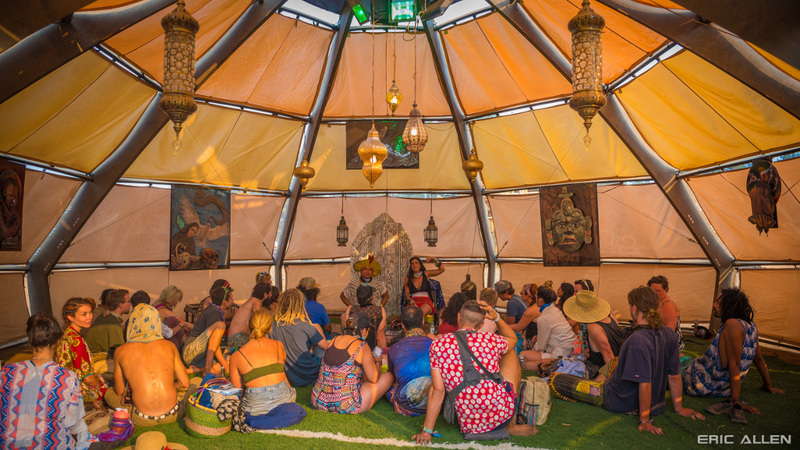 Our newest creation, Galapagos, provided the largest yoga stage for the festival, often holding over 200 people for the popular morning and evening classes held each day at the event. Galapogos’s effectiveness as a temporary yoga studio was enhanced by the padded floor Symbiosis’s team helped set up after the structure was complete. We were impressed by how cool and comfortable Galapagos was throughout the day and look forward to setting up this versatile shade structure again soon. 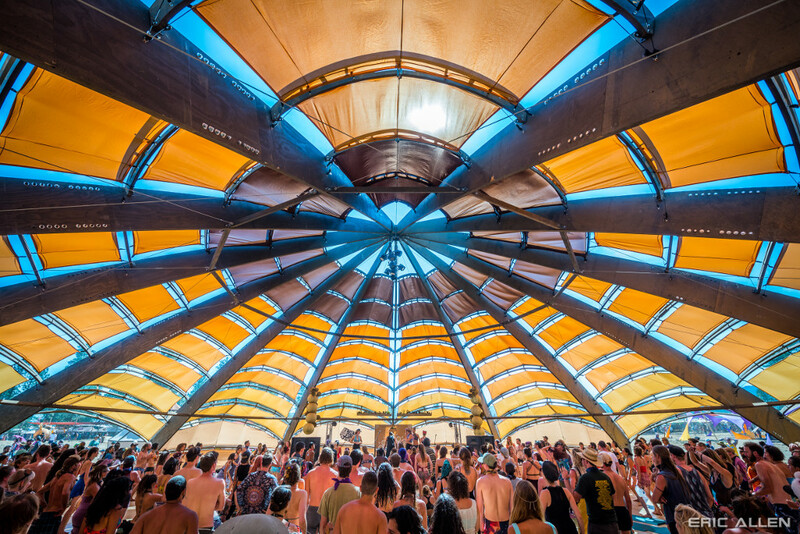 Returning from its debut at LIB 2017 as a combined yoga and movement workshops space, Wallapod looked better than ever on Big Summit Prairie for Oregon Eclipse. Though it is a bit smaller than Galapagos, the Wallapod often had just as many people participating in class and was widely adored for its intimate atmosphere and beautifully peaked, almost cathedral-like ceiling. The Smallapods, essentially miniturized Wallapods, were placed at a few different locations at Oregon Eclipse, offering intimate and comfortable workshop and ceremony spaces. The structures unique shape offered plenty of seating space inside while requiring a comparitively small footprint on the festival grounds. Oregon Eclipse was able to provide engaging and welcoming spaces for a large number of events using these quick to set up structures. We look forward to setting these up at a variety of events, large and small, in the near future.